A Czeck raised variety, new to our lists, which is being hailed as a good possibility for more Northerly areas. 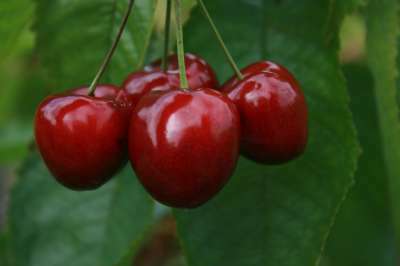 The pleasingly attractive deep red heart shaperd fruits have a deep purple flesh that is sweet and juicy and appealing eaten straight from the tree. Has plenty of juice; season mid August and usually hangs for around 2 weeks. Needs a pollinator but accepts pollen from a wide range of good self fertile varieties such as Summer Sun, Lapins, Stella, Sweetheart and Petite Noir.